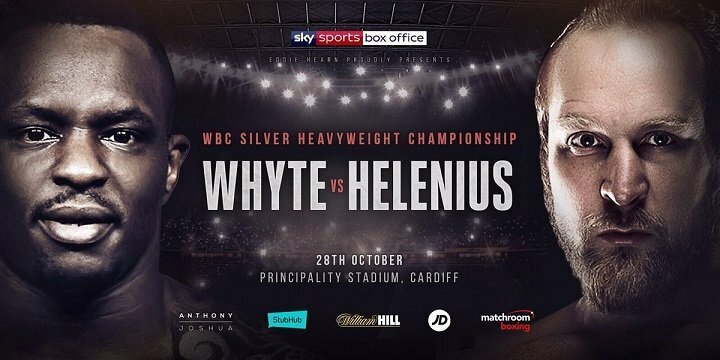 Dillian Whyte says he’s going to make life hell for Robert Helenius when they clash for the WBC Silver Heavyweight title at Principality Stadium in Cardiff on Saturday night, live on Sky Sports Box Office. Whyte wants to secure a showdown with WBC king Deontay Wilder in 2018 and knows that an impressive win over Helenius will take him a giant step towards that goal. ‘The Nordic Nightmare’ has vowed to destroy Whyte’s dreams, but Whyte doesn’t believe the former European champion will be able to stand the heat he’s preparing for the Welsh capital this weekend. “I don’t think he likes the heat which will play against him because I’m coming to cook something on Saturday,” said Whyte. “He was supposed to be the next Wladimir Klitschko, they were really pushing him at one stage. He’s had a couple of slip ups along the way but he’s very experienced compared to me. “I’m very close to a World Title shot and with all of the World Champions out there being tall we’ve been chasing tall opponents for the past few. We’ve been unlucky securing those fights so now we’re here with Helenius. Wilder defends his WBC crown next weekend in Brooklyn against Bermane Stiverne, the man he wrestled the title from in January 2015, but Whyte has been far from impressed with the Alabama man’s reign and wants to rip the belt from him as he looks to gain a huge rematch with Saturday’s headliner Anthony Joshua. “Wilder is a disgrace,” said Whyte. “I want to get into a position to fight for his belt because he is not going to do it voluntarily. “They will say AJ is number one. He has multiple belts and he’s the only one who is fighting the names. Wilder is a chump, he’s not fought a mandatory in two years and Joseph Parker is defending his title on YouTube so that shows his level. That says it all. Whyte’s clash with Helenius is part of a huge night of action in Cardiff where Joshua defends his World Heavyweight titles against Carlos Takam, one of three World title clashes as Katie Taylor challenges WBA World Lightweight champion Anahi Sanchez and Kal Yafai defends his WBA World Super-Flyweight title against Japanese mandatory challenger Sho Ishida. British Light-Heavyweight champion Frank Buglioni defends his title against Craig Richards, Lenroy Thomas and Dave Allen rematch for the Commonwealth Heavyweight title and Team GB Olympian and Welsh talent Joe Cordina appears in his fifth pro outing. “I will definitely win by knockout,” said Helenius. “He will definitely fall. I know it will be a tough fight, but it will be a tough fight for Dillian more than it will be for me, and it will be a loss on his record, that’s it. I hope he stands and fights with me and doesn’t run, as his reputation suggests. Whyte has been hunting a big name bout to move into prime position to land a World title fight and has landed that test in the shape of ‘The Nordic Nightmare’, and former European champion Helenius is gunning for a win to land his first World title shot.